This is a rectangular Thacker’s Ink Tablets porcelain sign. This particular Thacker’s Ink Tablets sign is predominantly yellow and blue. 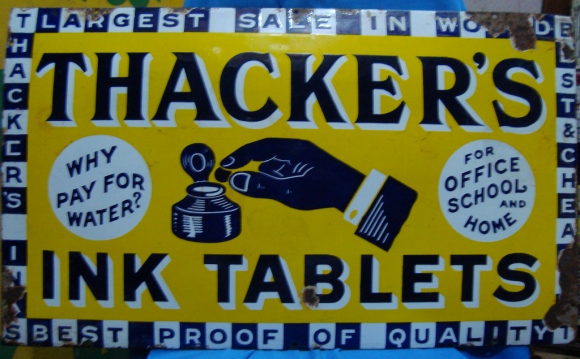 It reads, “Thacker’s Ink Tablets, Why Pay For Water?, For Office, School, and Home, Thacker’s Inks, Best Proof of Quality, Best & Cheap, Largest Sale In World” and features a blue hand holding a tablet over a ink well in the center of the sign.